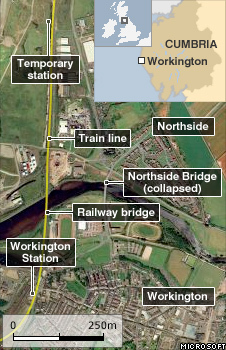 A temporary railway station has opened in Workington to help reconnect the two sides of the flood-hit Cumbrian town. Several bridges collapsed during the floods on 20 November, effectively splitting the community in half. A free hourly service from the new station - Workington North - takes passengers to the existing station on the south side of the River Derwent. 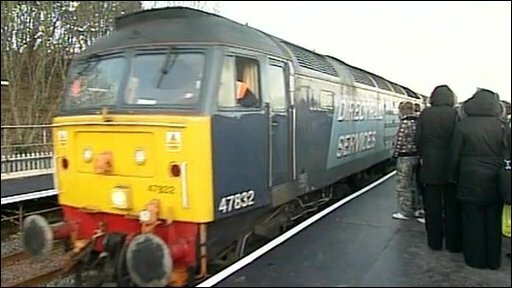 The first train on the service, which will run for at least six months, set off at 0550 GMT on Monday. The new station was built in six days on wasteland by Network Rail, and features two platforms, a portable waiting room, a gravel car park and a footbridge. The free service runs as far north as Maryport, a few miles along the coast. It is designed to help residents on the north side who face long detours to reach the town centre or local schools and supermarkets. The existing Northern Rail service, which runs the length of the Cumbrian coast, will also stop at the new station, meaning residents will effectively be able to catch a train every 30 minutes. In addition, Army specialists are continuing to work on a new footbridge, which is due to open by the weekend. Royal Engineers are laying 4,000-tons of rock base foundations for the 51-metre structure. The town's A597 Northside Bridge and a footbridge collapsed, while the Calva Bridge was left unstable, when the Derwent flooded. The only remaining connection between the two sides was the town's railway bridge. A spokesman for Network Rail said: "We are a big company with lots of engineering expertise and experience. "We knew we could help out and it's been a pleasure to provide Workington with a new station to reconnect the community." BT engineers are also working to re-route cables which run across the unstable Calva Bridge. If it were to collapse, 3,000 homes north of the river would lose telephone communications, according to Cumbria County Council. A special machine is being used to bore a hole under the Derwent, through which the cables will be re-directed. Meanwhile, Cumbria faces plunging temperatures and wintry showers over the next few days. Among the areas that could see up to two inches (5cm) of snow are those around Cockermouth, which was left under water after the heaviest rainfall recorded in England, according to forecasters MeteoGroup.